The 'East Anglia' Devolution Agreement was published by the treasury in March 2016 and signed by 22 of the 23 council leaders in Norfolk, Suffolk and Cambridgeshire. It outlines how the new combined authority will work and the powers of the new directly elected mayor. In the press people will have read that there is still a lot of discussion and uncertainty with regard to how devolution will work and the relationships between the different areas. NAVCA and Locality have published Devolution for People and Communities, a paper outlining a set of key principles which should underpin devolution form a VCSE perspective. 1. Creating a social economy. 2. Representation of the voluntary and community sector within new leadership structures. 3. Ensuring accountability through effective community engagement. 4. Decisions taken at the most local level appropriate. 5. Working with local organisations to transform public services. All Norfolk and Suffolk Councils and the New Anglia LEP are involved in the Government discussions concerning devolution. 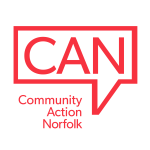 CAN are currently exploring with partners locally the best way to ensure Norfolk’s voluntary, community and social enterprise sector is informed and engaged with the devolution process.